Trey Higdon, founder of Perfect Stix, was raised in an entrepreneurial family so when one of his employer's customers voiced an unmet need, Higdon launched his own company to fill that need. "Out of college I was selling food and one of my customers was an Italian ice company that was having difficulty sourcing wooden sticks," he said. "My entrepreneurial mind went to work on it and I ran with the idea. I started importing sticks for them. 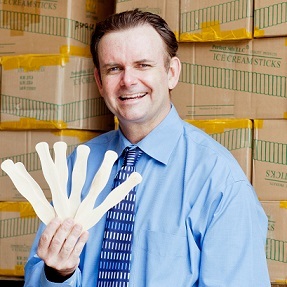 After a while, I quit my job and developed a whole line of ice cream sticks." Sixteen years later in 2017, Perfect Stix employs 25 and has full product lines in food, medical and paint products, not to mention its Earth friendly line. "We're a green company," Higdon explained. "We're reducing the amount of plastic in landfills with our biodegradable wooden disposables that include knives, forks, spoons and plates. We also customize in house so if a client wants to order 300 custom sticks, we do that in house with our 10 pad printing machines. We make it to order here." Higdon's message to aspiring entrepreneurs is to take the risk if you have the desire. "Go for it," he said. "If you see a niche, you’ve got to work hard and go for it. Take the risk. If you feel strongly, then go for it because you can find resources."